Sama ka chawal or Mordhan as this grain is called in Hindi, the botanical name is Echinochloa colona . A very tasty grain that can replace rice for those who want to eliminate grains from their diet or for fasting days. A tehri is a fried rice or pulao/pilaf like dish that is mildly spiced and requires a side dish like raita and a curry or chutney etc. This sama ke chawal ki tehri is made with grated carrots. 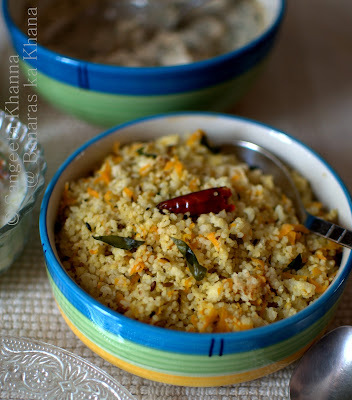 You might like to add some grated coconut as well to add to the taste and texture. Heat the ghee in a thick base kadhai or pan or pressure cooker pan (not to be pressure cooked, but the cooker pan is a good utensil to use otherwise too) and tip in the broken red chilies and cumin seeds. Let them splutter. add curry patta and immediately add the grated carrots as well. Add any other vegetable if using. Stir fry for a couple of minutes or till the carrots wilt. Add salt and the drained sama ke chawal. Add the measured amount of water, mix everything well and cook covered on low flame. It cooks just like rice so check after 5-6 minutes and turn off the heat if the grains have absorbed all the water and have become al dante'. Keep covered for a while as it cooks on even after taking the pan off the flame. 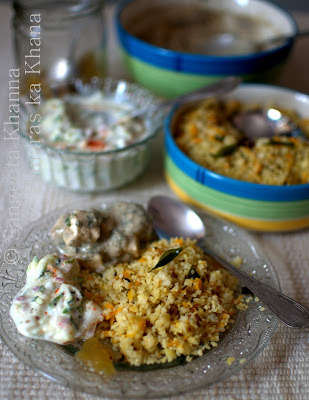 Serve with raita and any curry or chutney on the side. Add fresh lime juice if required. I served it with zucchini raita and a quick paneer methi malai which is a fasting recipe too. I also had a little angoor ki chutney on the side. It was a yummy satisfying meal, full of varied flavors. 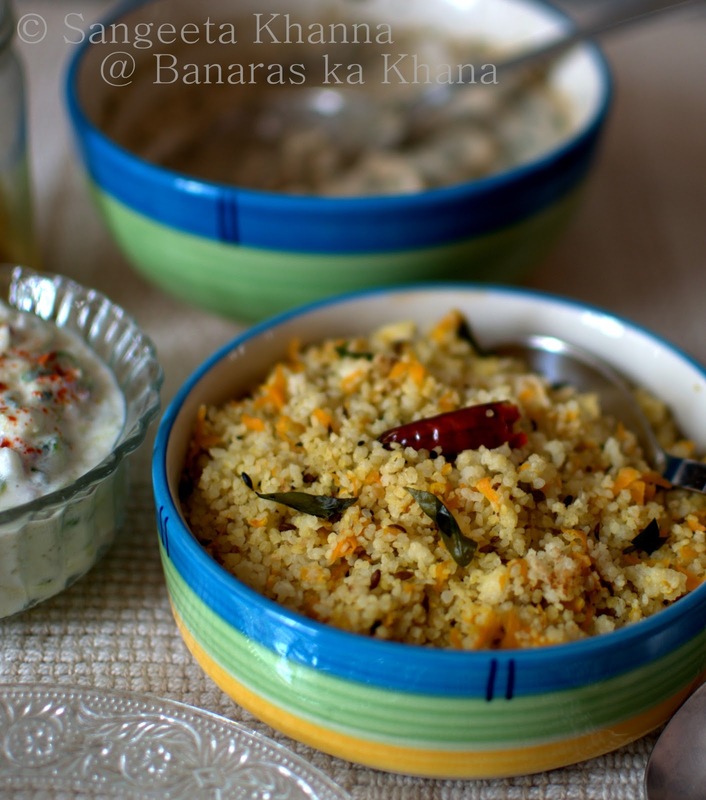 Fasting food doesn't need to be boring and dull. You can always cook it interestingly. A very delicious and tasty dish. Looks so delicious and a very healthy dish indeed..